Remainder theorem basic rules were given in the following link. 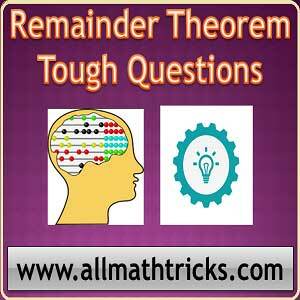 Here provides some examples with shortcut methods on remainder theorem aptitude. Finding the last digit of an expression purpose simply find the remainder of that expression divided by 10. In the same way for finding the last two digits of an expression purpose find the remainder of that expression divided by 100. Solution: Now the above expression divided by 100 and find the remainder then it will equal to last two digits of given sum. Hint: If any 3-digit which is formed by repeating a digit 3-times then this number is divisible by 3 & 37. Hint : If any 6-digit which is formed by repeating a digit 6-times then this number is divisible by 3, 7, 11, 13 and 37. Hint : The above sum simple we identifying that every three terms the remainder is zero ( 4 + 4+ 4 = 12 / 6 0 ) so upto 99 terms the remainder is zero. Solution: Here find remainder of the each number individually. Hint: If the given expression like ( an – bn ) and “n” is even number then (a-b) and (a+b) are exactly divides that expression. Hint: If the given expression like ( an + bn ) and “n” is odd number then (a+b) is exactly divides that expression. Hint: If the given expression like ( an – bn ) and “n” is odd number then (a+b) is exactly divides that expression. Solution: Here 52p = 25P = (26 – 1)P So the reminder depend upon value of P.
Solution: The last digit of an expression purpose simply find the remainder of that expression divided by 10.